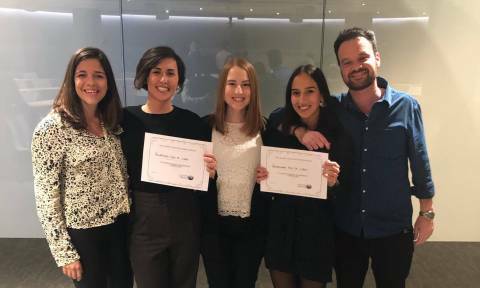 The NOVA Law School team, made up of masters students Catarina Carreiro, Catarina Cerqueira and Carolina Roque, trained by Rute Alves of PLMJ and André Pereira da Fonseca of Abreu Advogados, won the IV Arbitration Pre-Moot of Madrid ACMEY that took place between February 28 and March 1 at the offices of Linklaters, Hogan Lovells, Allen & Overy and Cuatrecasas in Madrid. The support of the lawyers Rute Alves and André Pereira da Fonseca to the team was born from a protocol between NOVA Law School and the Portuguese Arbitration Association, sub 40. NOVA team won the 1st place among 16 participating international teams, receiving not only the "Best Team" award, but also "Best Claimant", being the first time that a Portuguese university won an international refereeing competition. The competition is part of the preparation for the 26th Willem C. Vis Moot, which will take place in Vienna, Austria, in April this year, consisting of the simulation of several trial hearings, in arbitration proceedings, in which the various teams - from different universities in the world - competed against each other, defending, in audience, their position in a fictional commercial arbitration. In addition to this stage of simulation of arbitration, the preparation of a team for a moot court of arbitration includes the preparation of procedural documents and an intensive study of the facts of the case and law, namely international doctrine and jurisprudence.